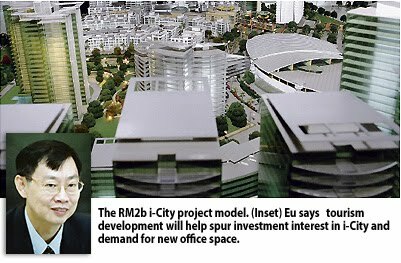 I-BERHAD, an integrated ICT developer, will start to build three properties worth about RM700 million at its i-City development in Shah Alam, Selangor, by the end of this year. The properties are a serviced apartment block with over 100 units, a 210-room boutique hotel and a 300,000 sq ft data centre. Chief executive officer Eu Hong Chew said the projects are meant to improve its income and enhance the land value, which is now about RM400 million. "Because of the development model, we have vested interest to ensure that the property and land value will continue to be enhanced," Eu told Business Times during a recent study tour to Seoul, South Korea. i-City, a RM2 billion knowledge and tourism project which started in 2005, will be developed on 29ha, over the next 10 to 15 years. I-Berhad bought the land in the early 1990s for some RM60 million. Eu said the company had invested RM150 million in the development, which now boasts a broadband speed of 20Mbps with fibre optics network and a back-up power supply. Some 20 per cent of the land area has also been developed with cybercentre office suites, data-centres and an innovation centre with a combined 500,000 sq ft of space. Eu said the company is expected to sign soon a joint venture agreement with a major local property developer to build the serviced apartments. It also plans to do the same for the hotel development. For the data centre, I-Berhad has a strategic alliance with a company called HDC, controlled by Datuk Richard Fong Loong Tuck, who is Glomac Bhd group executive vice-chairman. "We believe that the tourism development will spur investment interest in i-City and demand for new office space," Eu said. Future developments at i-City will include a one million sq ft mall, almost equivalent to Mid Valley Megamall in Kuala Lumpur, a four-star and five-star hotel, amusement park and an animation studio. Eu said I-Berhad is in talks with foreign operators to help develop the mall. He declined to name them. It is learnt that I-Berhad is talking to a major operator in Australia. Earlier reports speculated that Singapore's CapitaLand Ltd would be its foreign partner.